Solid phenolic core panels are constructed with phenolic resins that saturate and impregnate kraft paper materials, then compressed under high heat and pressure to form a composite structural panel. The working surface of countertops, fascia for cabinets or the entire structural cabinet or casework is factory covered by a decorative melamine layer during the oven compression process. The result is an extremely durable, impact and water resistant material having a multitude of uses and applications in laboratories, R&D facilties, water treatment plants, hospitals, life science facilities, etc. Phenolic resin composite panels are produced with factory applied melamine surfaces similar to those found on Formica Countertops, so essentially, it is offered in the same, almost limitless color and pattern selections of plastic laminate. Unlike plastic laminate, however, the solid phenolic panels are a solid composite material, with no wood core substrate material required, thus eliminating the problems of delamination, bubbling, edge banding, moisture absorption, chipped edges, etc., that is typically associated with thin laminate material. The composite nature of the phenolic resin materials makes phenolic an ideal product for wet, humid applications or the fabrication into cabinetry, cupboards, tall or upper storage cabinets with or without tempered glass inserts. It is an extremely durable, impact and water resistant material. With melamine surfaces of decorative colors of solids, wood grains or granite like patterns, solid Phenolic panels offer almost limitless color and pattern selections. 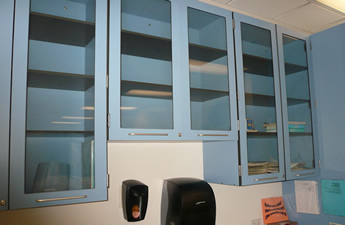 A popular and growing choice among architects and consultants, solid phenolic core cabinets and casework are high impact resistant and are available in Class B or Class A fire ratings under a special production process. 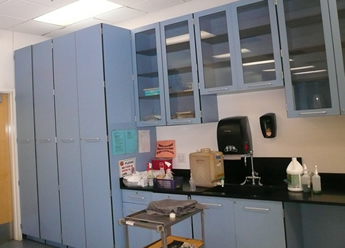 With the addition of a chemical resistant surface overlay material, the Phenolic core products are well suited to laboratory applications in biology, physics, chemistry laboratories as well as toilet partitions, and other research testing facilities. 2) Finishes of matte and quartz / embossed. 3) Solid colors, wood grains and granite like surface patterns. 4) Black Phenolic Core with low VOC’s. 5) Chemical resistant, high wear-resistant, fire-resistant, anti-static characteristics. 6) Resistop is manufactured utilizing Phenol Formaldehyde resins (Phenolic Resins) rather than Urea Formaldehyde. Phenol Formaldehyde resins produce less free formaldehyde and thereby reduce the level of airborne contaminants in indoor air environments. 7) Resistop sheets contain a minimum of 20% recovered materials by weight and only use certified renewable forest products. They contain no heavy metals, rain forest timbers or tropical hardwoods. 8) GreenGuard certified and LEED qualified. 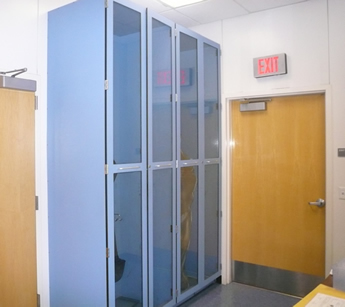 Used in furniture casework, upper cabinets with tempered glass inserts or solid phenolic doors, furniture drawer or door fronts, toilet partitions, table tops, worktops, countertops, bench tops, furniture surfaces, laboratory tops, toilet cubicle, hospital table tops, food courts, ticket booths and more. Wherever Laminate surfaces or steel furniture is used, solid phenolic is a suitable and cost effective alternative providing long life and high resistance to chemical and physical abuse conditions. 1. Chemical and corrosion resistant phenolic resin cabinet. Constructed with concealed fasteners. 2. Reinforced cabinet bottom prevents deflection under maximum loads. 3. Sliding doors mounted on upper track or fixed for efficient operation. 4. Front edge of shelf supported to prevent deflection. 5. Drawer, door and cabinet body made with 1/2" thick black core chemical and corrosion resistant phenolic resin. 6.Self-closing epoxy coated drawer slides. 7. Removable back panel for convenient access to service chase. 8. 270° heavy duty five knuckle institutional hinge with baked on black epoxy finish. 9. Durable black nylon wire pulls. 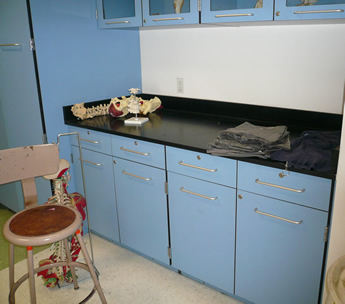 Phenolic Resin Casework is made from ½” thick solid phenolic panels that have been thermo-fused under heat and pressure to form a solid black chemical resistant phenolic core. 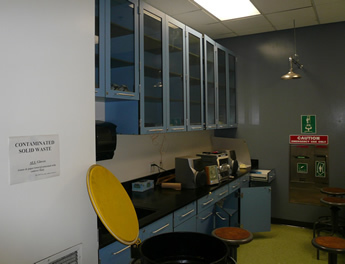 Phenolic resin casework should be used wherever strong chemical and/or corrosion resistance is required. 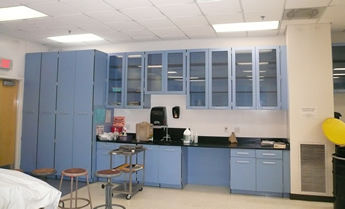 TLS offers a variety of color choices and can supply solid phenolic resin countertops in RESISTOP or DURATOP Epoxy lab tops to accompany your cabinets. 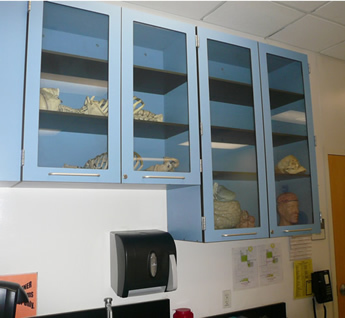 K-12 schools, university or medical lab facilities demand storage solutions that are durable, attractive and functional. 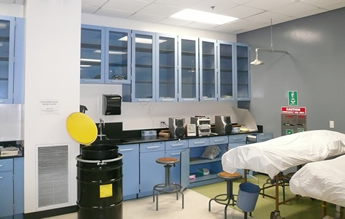 With hundreds of casework designs and virtually unlimited custom options, we can provide a solution to your laboratory requirements. 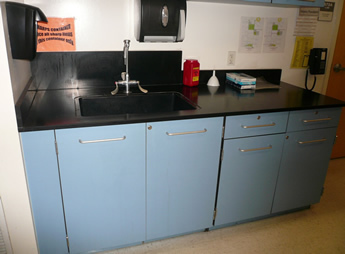 The solid phenolic countertops or casework is not the old Formica .039” to .045” plastic laminate material that required wood substrates, edge banding and gluing with noxious glues and found primarily in kitchen countertops or fascia material for cabinets. The new generation of solid phenolic panels have been engineered to withstand impact, water absorption and chemical attack without the use of particle board substrates, edge banding or gluing. Those elements of the old plastic laminates are yesterday’s technology and are being replaced by architects and consultants with superior quality solid phenolic materials. Contact us today for pricing and availability of Resistop Solid Phenolic casework and furniture.